Paris celebrated its Fashion Week this past week. 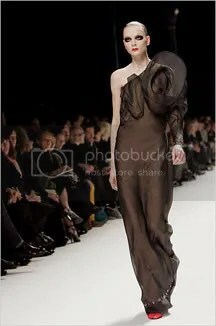 Paris, for those of you who don’t know, is the birthplace for most new style ideas and trends, and because of this, is considered the most important city to the fashion world. Hence, this particular week brings out the best of the best in the industry, and celebrities of the highest distinction travel from all over the world to come support their favorite designers (note: Mary-Kate Olsen). I dig the heart shaped stitching. Gives off a “homemade valentine” kind of vibe. It’s sweet. And this model resembles someone. I can’t think of who, though. Oh, right. She looks like this guy I know, Satan. I like this dress. It speaks for itself. Literally. And what a strong message it sends. 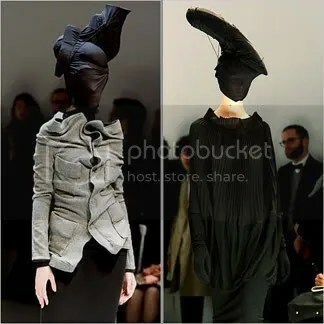 Oh, I love it when people from the future travel back in time just to participate in Fashion Week. 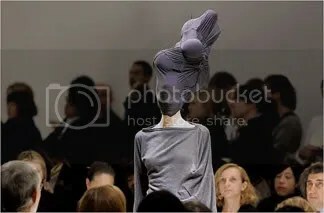 This ensemble reminds me of a right-before-bed ritual my older sister used to practice on me called “try to suffocate my little sister.” Also sometimes referred to as the “If you don’t let me wrap this sheet around your head, I’ll punch you” game. It was a lot of fun. I hope that out of everything we’ve seen, this trend catches on the most. Not only because of the feeling of nostalgia it stirs up, but because it is so practical. 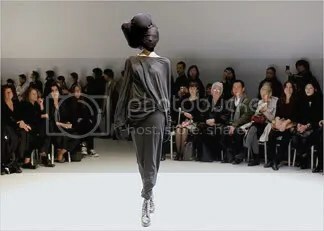 I will say though, outside of the “head wrap,” I think Junya Watanabe’s designs are stunning. I cannot see your faces. Whether or not you agree with my commentary, I hope you’ve gained some new ideas from these outfits. I know I have.